Mothers and babies need you to keep up the pressure on Nestlé now more than ever – look at what it is really doing. Why target Nestlé with the boycott? 1. Nestlé is the biggest and most aggressive of the baby food companies, pushing its baby milk in ways that mislead parents and undermine breastfeeding (ref. 1). For example, it promotes its formula with claims such as it is the ‘natural start’ (left – more examples below). Around the world it employs teams of Medical Delegates or Nutrition Representatives to target health workers to encourage them to recommend its infant formula to pregnant women and mothers. Babies fed on formula loose out on the protection provided by breastfeeding. They are put at even greater risk where water is unsafe, hygiene is difficult and parents struggle to afford enough formula and might over-dilute it. Nestlé’s marketing practices break UN marketing rules, but Nestlé refuses to stop them – unless forced to do so by law or under pressure from our campaigns. 3. Nestlé has rejected Baby Milk Action’s four-point plan aimed at saving infant lives and ultimately ending the boycott (ref. 4). The first point is to accept the validity of the International Code of Marketing of Breastmilk Substitutes and subsequent, relevant Resolutions of the World Health Assembly. The second point is to bring policies and practices into line. In ongoing correspondence with Baby Milk Action, executives say, ‘Nestlé has always done its utmost to comply with the WHO Code as implemented by national governments’. This qualification ignores Nestlé’s responsibility under Article 11.3 of the Code to abide by its provisions ‘independently of any other measures’ – many governments have not implemented the Code and Resolutions or have only done so partially, often because of industry pressure (ref. 5). 4. In response to IBFAN’s global monitoring report, Breaking the Rules, Stretching the Rules 2014, Nestlé’s Head of Nestlé Nutrition said that 90% of the violations comply with Nestlé’s own polices, revealing how the violations are not an accident or due to rogue staff, but a matter of policy (ref. 6). Rather than responding positively to campaigns, Nestlé uses dirty tricks – in January 2013 it was ordered to pay compensation to ATTAC Switzerland after sending spies to infiltrate the group and gather information on who was contributing to a book on Nestlé, covering its baby milk marketing, trade union busting, exploitation of water resources and other concerns. 5. One of Nestlé’s current marketing strategies is to undermine the ‘breastfeeding is best’ warnings the boycott helped to bring in. It is adding colourful logos to labels claiming its baby milk is the ‘natural start’, the ‘gentle start’ and ‘protects’ babies. However, breastfeeding is the natural start and babies fed on substitutes are more likely to become sick than breastfed babies and, in conditions of poverty, more likely to die (ref. 7). Click on the image left to download a pdf of a poster showing Nestlé’s labels from selected countries. This contrasts Nestlé’s claims to support breastfeeding and follow the Code with what it actually does. 6. It is not only Baby Milk Action and IBFAN that accuse Nestlé of violating the Code and Resolutions. Save the Children produced the report Superfood for Babies in 2013 with its own monitoring evidence from countries including China, India and Pakistan. Chinese television has exposed bribing of health workers. In its report on Nestlé for the United Reformed Church in 2010, ethical investment organisation EIRIS cites examples of ‘total or substantial violation of the International Code of Marketing Breast-Milk Substitutes’. Nestlé produces impressive policy statements and reports, but it is what it is actually doing that harms health. When violations are reported, Nestlé dismisses them. Baby Milk Action is in on-going communication with Nestlé, and executives at the highest level defends its marketing practices. 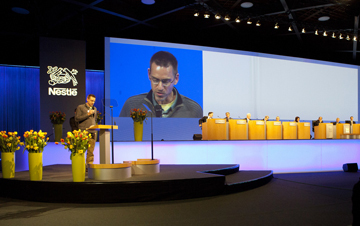 Left, Mike Brady, Baby Milk Action Campaigns Coordinator, calls for action from the board of Nestlé at the company’s shareholder meeting on 19 April 2012. Nestlé Chairman, Peter Brabeck-Letmathé, response was that it is not for Baby Milk Action to tell him what to do. He again rejected the call to act on the monitoring reports of IBFAN, Save the Children and others at the 2014 shareholder meeting. There are other issues, such as the way Nestlé is using its Fairtrade KitKat to divert attention from its cocoa purchasing record. While Fairtrade KitKat benefits the producers of the less than 3% of cocoa sourced by Nestlé for this product (2.6%), Nestlé has failed to deliver on its promise to end child slavery in its cocoa supply chain by 2006. It has been taken to court in the US by campaigners acting on behalf of former child slaves from Ivory Coast. Child-slavery campaigners issued a press release showing they are not too impressed by Nestlé’s commitment, click here. Ref. 1: The Save the Children report Superfood for Babies (2013) cites industry figures giving Nestlé 23% of the global baby food market (prior to its takeover of the Pfizer Nutrition and Wyeth brands, such as SMA). Danone is given as controlling 14%, with Mead Johnson on 11% and Abbott on 8%. The remainder is controlled by smaller companies. Ref. 2: Nestlé is the target of a boycott as it systematically violates the Code and Resolutions and, as the market leader, drives down standards for the industry as a whole. It also takes the lead in attempting to weaken national regulations. The latest global monitoring report, Breaking the Rules, Stretching the Rules 2014, shows Danone is rivalling Nestlé as a source of violations as they compete around the world. This is despite the fact Danone promised it had taken action to stop 50% of the violations in the previous report, Breaking the Rules, Stretching the Rules 2010. Accordingly, Baby Milk Action launched a DanoNO campaign in May 2014, calling on health workers and charities to distance themselves from the company. The ‘Say NO to formula company sponsorship’ campaign extends to all companies. Our Campaign for Ethical Marketing action sheets target violations by any company. Ref. 3: Many health facilities in the UK prohibit formula company representatives from meeting with staff. Information can be provided to a designated expert only for assessment, with only accurate and necessary information passed on to other staff. Nestlé and Danone both run their own events to try to bypass these restrictions. For the first time, Hipp was found offering similar events to health workers in May 2014, showing how the increased competition is driving down standards. In South Africa in 2007, the Infant Feeding Association took Nestlé to the Advertising Standards Authority over its supermarket promotion of its formula labelled with the new ‘protect’ claims. According to the ASA ruling: The ruling states: ‘The complainant submitted, in essence, that the campaign goes beyond informing consumers of a change in packaging by drawing much attention to the brand. This contravenes both the World Health Organisation (WHO) Code and the Code of Advertising Practice, which [sic] practices used to induce sales directly to the consumer at retail level’ [Presumably it should read ‘prohibits practices’]. The ASA is a voluntary body funded by advertising revenue, making Nestlé a major funder, and it rejected the complaint, meaning Nestlé’s competitors may feel compelled to use a strategy they feel violates the marketing and advertising codes. The South African Department of Health informed Baby Milk Action that it is usually consulted by the ASA on rulings impacting on health, but had not been in this case. Click here for further details. Ref. 4: Click here for full details and assessment of progress with the four-point plan. Ref. 5: Letter from Nestlé Global Public Affairs Manager, 2 April 2014. In one example of industry pressure on governments, the Minister of Health of Zimbabwe accused Nestlé of ‘economic blackmail’ (see Boycott News 26 on our archive site). In addition to the risks posed by not having breastmilk’s protective qualities, breastmilk substitutes and feeding bottles in particular carry a high risk of contamination that can lead to life-threatening infections in young infants. Infant formula is not a sterile products and it may carry germs that can cause fatal illnesses. Artificial feeding is expensive, requires clean water, the ability of the mother or caregiver to read and comply with mixing instructions and a minimum standard of overall household hygeince – factors not readily met in many households in the world. Improper marketing and promotion of food products that compete with breastfeeding are important factors that often negatively affect the choice and ability of a mother to breastfeed her infant optimally. Given the special vulnerability of infants and the risks involved in inappropriate feeding practices, usual marketing practices are therefore unsuitable for these products.